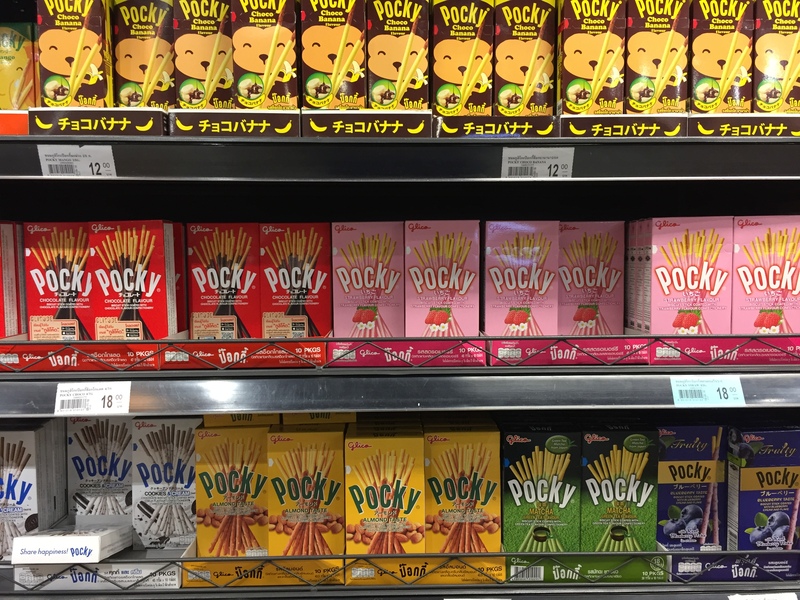 we ate a bunch of pocky (the coated japanese sticks) while in thailand, so many that by the end of the trip i was starting to get a bit sick of them… but thoroughly schooled on all the different flavours available. there are so many of them! and the original is always nice. 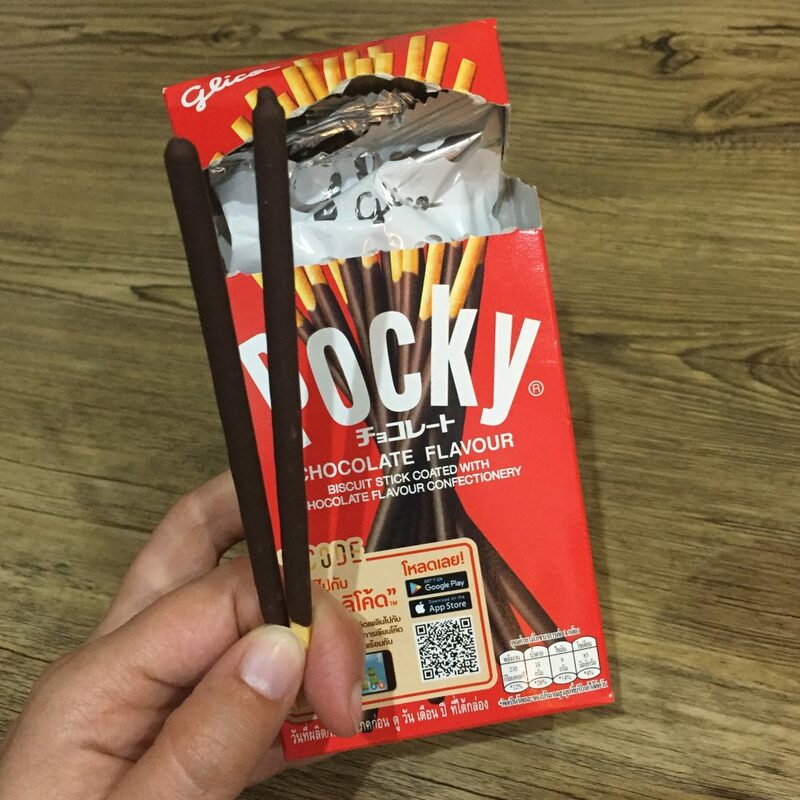 in hindsight, i wish we had discovered “glicode” (glico is the name of the japanese brand that makes pocky) before we had left thailand though — we could have had fun playing with it! 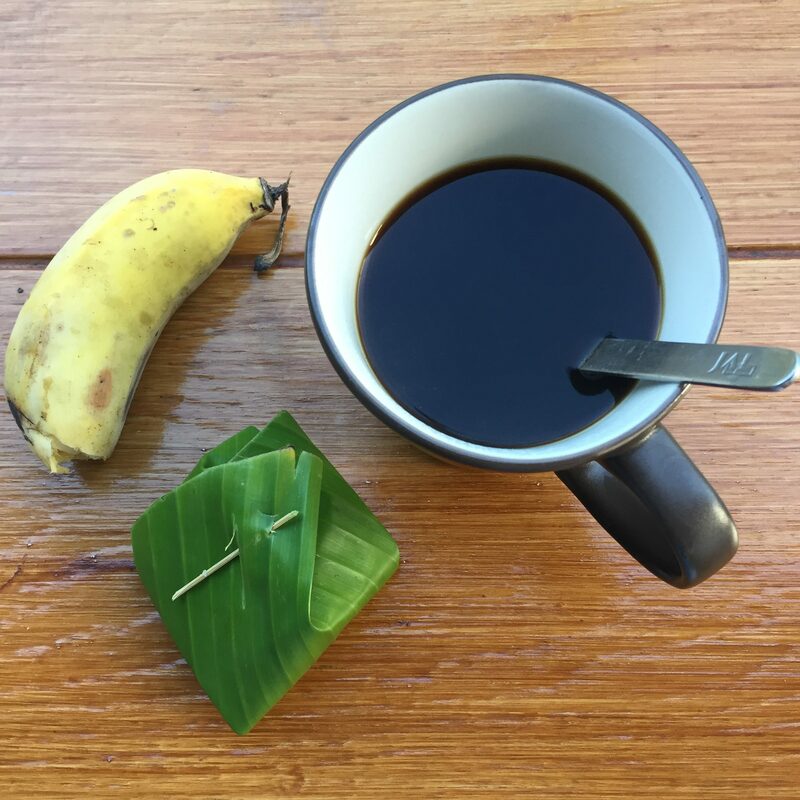 the hostel where we stayed in chiang mai had these very intriguing handmade “parcels” of banana leaf, just laying on a basket on the breakfast table… what were they? curious to find out, we removed the pin, unwrapped two layers of leaves and whoa! 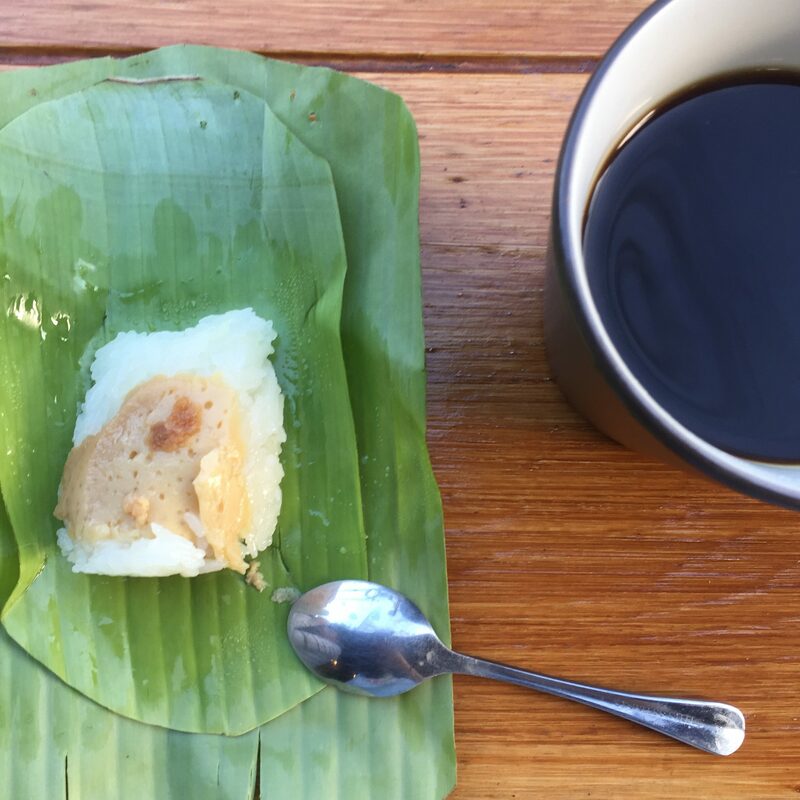 nested inside, we discovered a spoonful of sticky rice, with pudding on top! 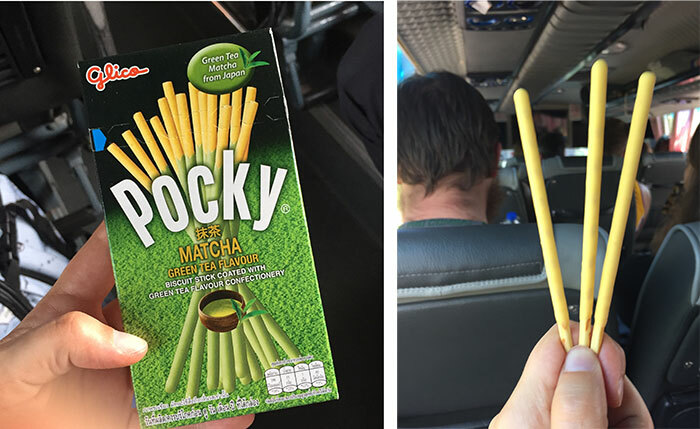 it was great, and just small enough to provide a quick sweet bite. 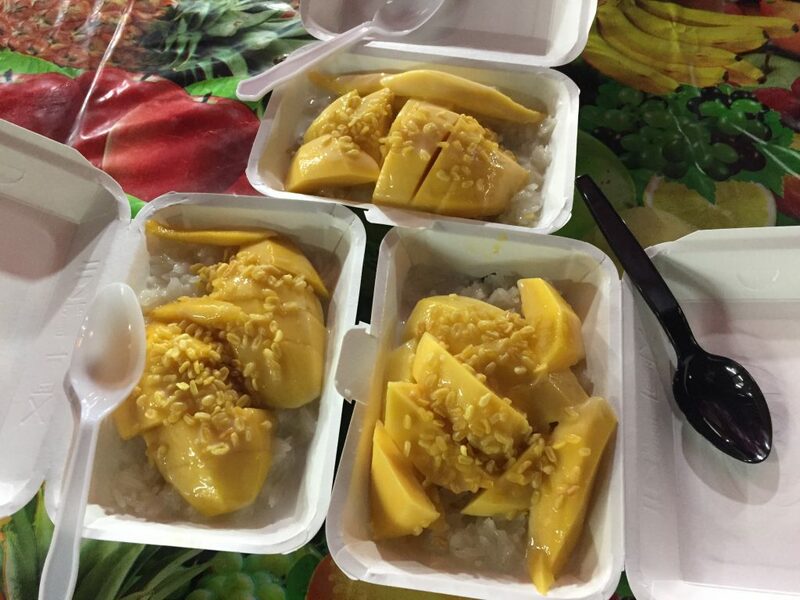 i want to write an ode to the perfection that is mango with sticky rice… but i’m not a poet and words fail me. 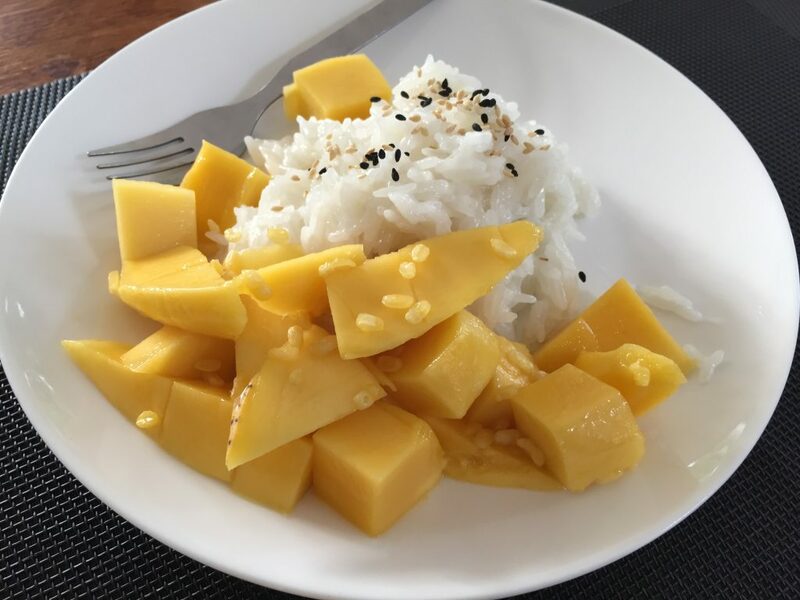 what is it about the combination of sweet glutinous rice cooked in coconut milk and buttery yellow mangoes that makes this probably the best dessert ever? is it the hot and cold dynamic? is it the fact that there’s fruit to spice up what would otherwise be a milchreis? is it the coconut milk, mellowing the rice and turning the flavor into something exotic? i have no answer to these questions. all i know is that whether they’re served in street food carts or on a restaurant table, the result is always the same: an explosion of flavors in our mouths that make our eyes close in happiness. 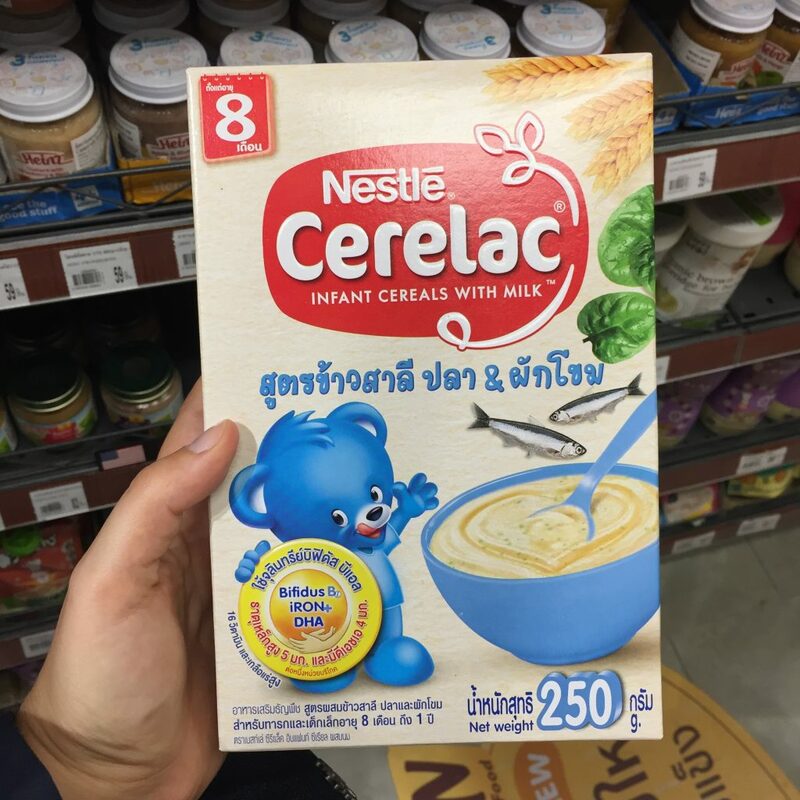 at some point we started cooking it on our temporary home in koh samui, because we couldn’t bear to go a minute longer without it. we’ve eaten so much of them that i fear that we’ll go through withdrawal symptoms once we get back. 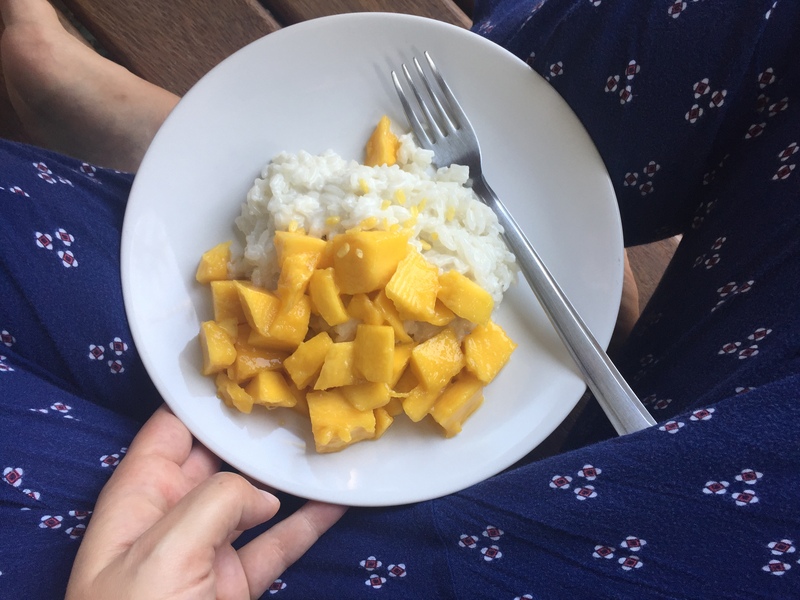 alas, i’ve never seen a yellow mango in europe, and they’re so much better than our “normal” mangoes, that i wonder if we could get away with planting a mango tree in our backyard. it would take some years for it to grow, but it would definitely be worth it. mmmm…. 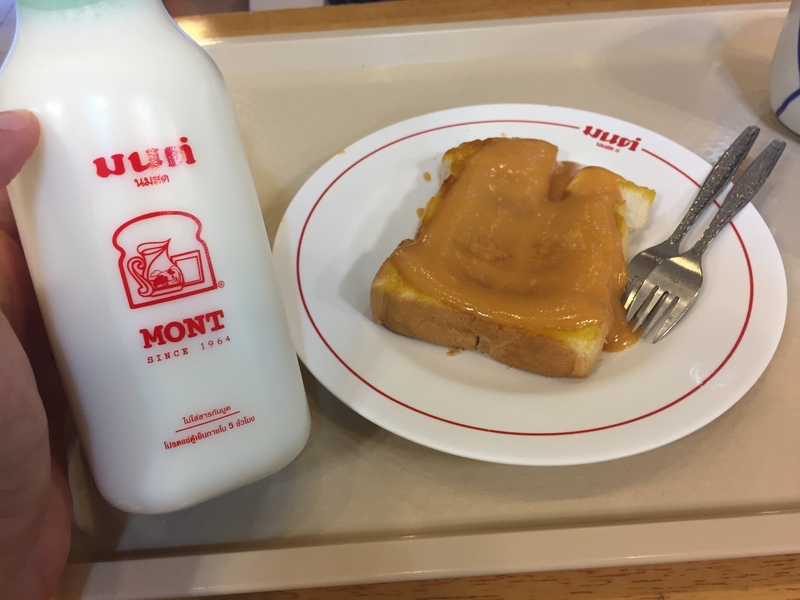 i didn’t expect toast to be such a big thing in thailand, but we’ve seen them a bit everywhere, always covered in garish toppings or (more often) condensed milk and served with hot or iced milk. 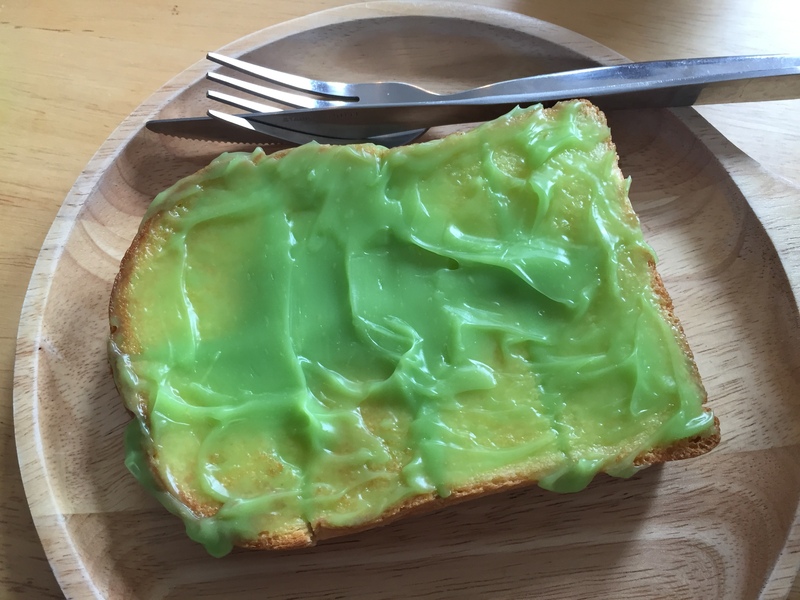 i confess it feels a bit strange for me to eat such sweet stuff on top of warm bread, the sweetness of the topping amplified by the heat becoming somewhat cloying… but truth be told, it kind of grew on me. 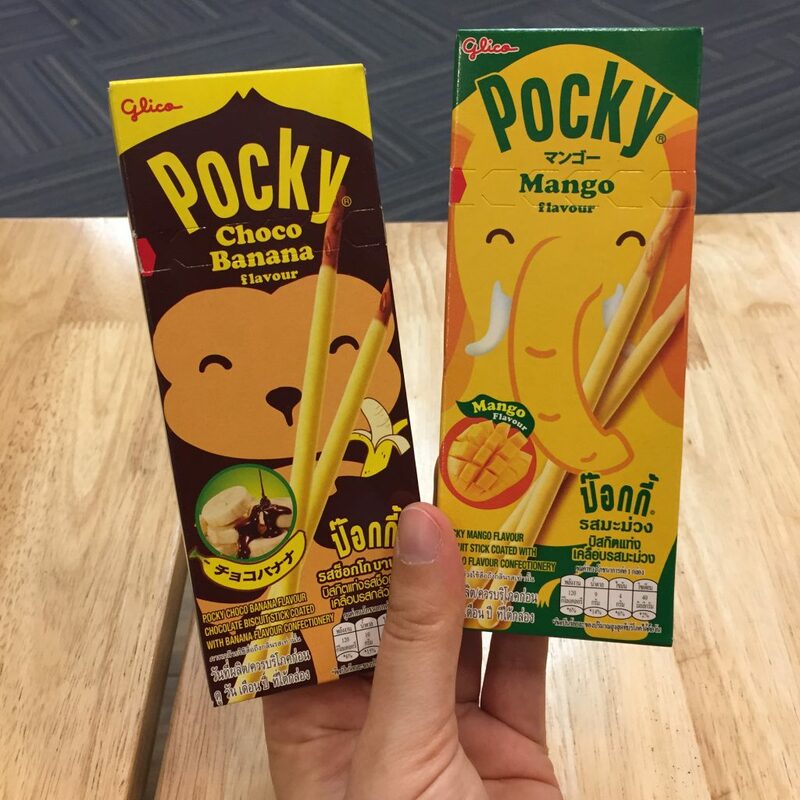 they come in all kinds of funky flavors, like taro, coconut or pandan custard (or the default, condensed milk). 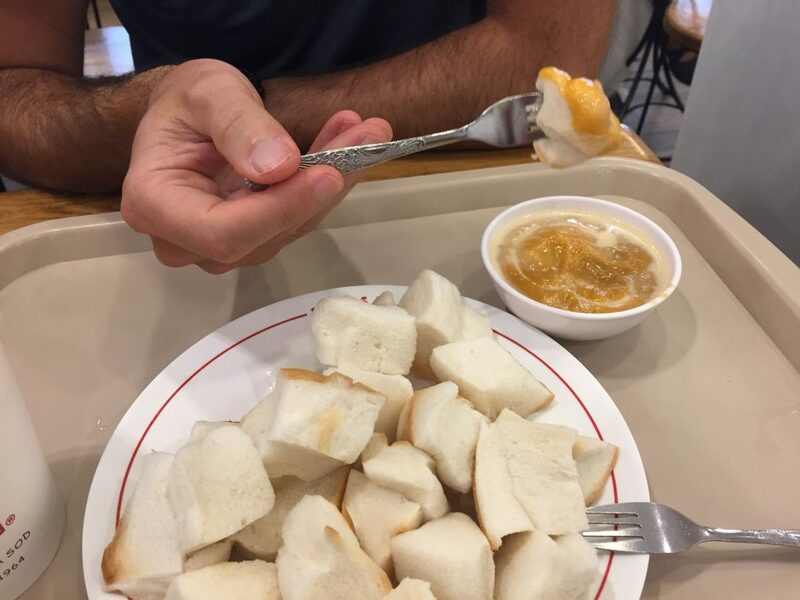 on our last day, we tried a different version at mont nom sod: steamed chunks of fluffy white bread, with a coconut custard dipping on the side. it’s soooo good! …is a bit different from our own! 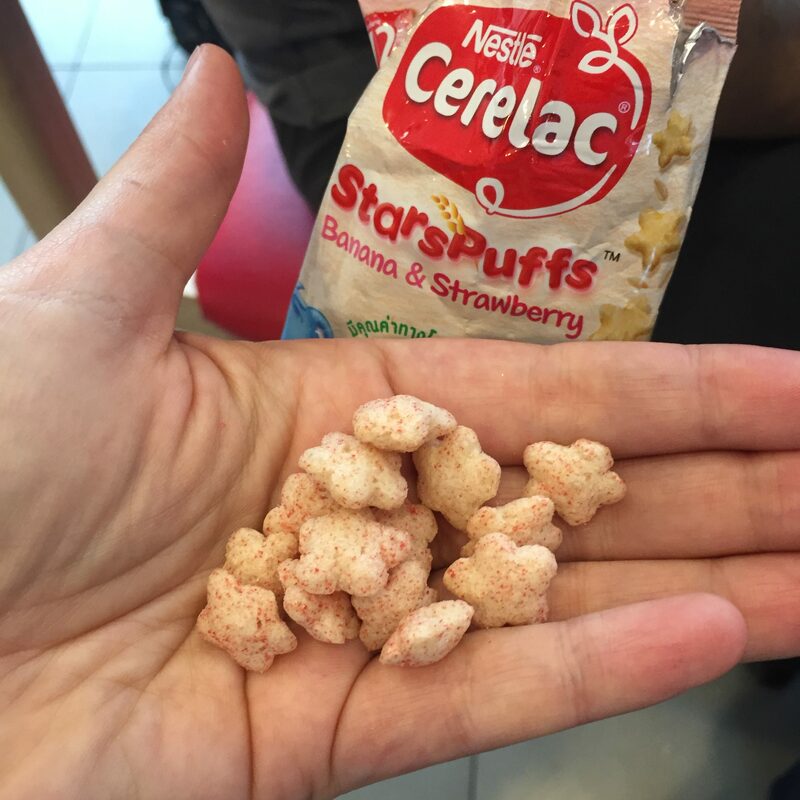 first, they have these “stars puffs” thinguies that melt into nothing in your mouth and they taste a little bit like childhood. you are currently browsing the archives for the foooood category.